Parking lots of all types use signage to instruct drivers where they can and cannot park their vehicles. Having parked or idle vehicles in your load zone spaces can be a huge hassle for other drivers trying to quickly load and unload materials, passengers, baggage, or other deliveries. Having the appropriate warnings posted is a great way to grab any driver's attention and to clearly state the regulations of any marked loading areas. 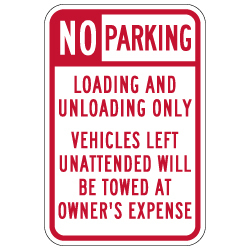 Customers will not know they are at risk of being towed if they park in a load zone area without the display of this type of signage in a lot. 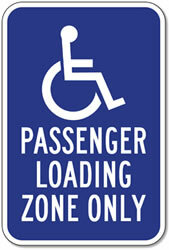 Loading zone signs are a necessity to help maintain control over your parking lot and to allow other drivers access to spaces they can use to quickly drop off or pick up items efficiently. Typically most zone areas have a time limit of five minutes for rapid loading and unloading as long as the intended use is meant for the transfer of goods or passengers. This means that any vehicle can use these loading zone areas for as long as the vehicle isn't left unattended for more than 5 minutes. Using the proper signage, you can strictly enforce the regulations and help other drivers avoid having their vehicles towed due to parking violations. The issues most owners have is unwanted parked vehicles hogging up load zone spaces meant for the quick and important loading and unloading of materials. These areas are meant for short-term use and posting the appropriate notice will help to maintain the flow of daily traffic. 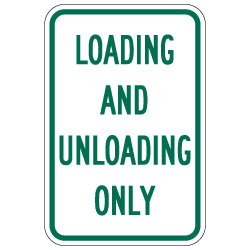 With the variety of choices we offer for our Load Zone Area signs, you have the option to set a time frame for parked vehicles to use your loading zones. Whether it be immediate drop offs, a fifteen minute time frame, or even a time limit of thirty minutes, we have the sign that will be best suited for your needs.